In other words, the Ultimate Collector's Lot! Enough hype, here's what you'll get. Final Fantasy VII for PS1 (NA Version) : Brand New. This is a sealed copy of the one that started it all! Please note the small hole in the top right of the case. 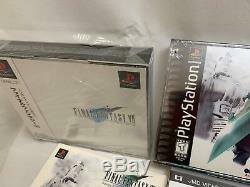 Final Fantasy VII for PS1 (JP Version) : Brand New. This is a sealed copy of the original Japanese release of FF7. Please note a small crack on the front of the case as well as a little bit of the plastic has torn a bit on the top. 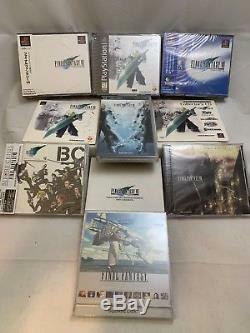 Final Fantasy VII International (JP Version) Brand New. This version was only released in Japan after the US version was. Final Fantasy VII PC Version : Brand New. This is the rare square box version of the game. 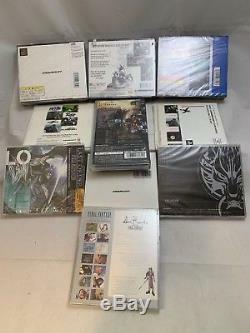 Final Fantasy VII: Advent Children on PSP (JP Version) : Brand New. This is the Japanese version of FF7:AC on PSP UMD. Final Fantasy VII Demo Disc : Brand New. This is a rare demo disc distributed by Sony which features the FF7 demo as well as content for other Squaresoft titles: SaGa Frontier, Bushido Blade & Final Fantasy Tactics. Squaresoft on PlayStation Collectors CD : Brand New. This is an even rarer demo disc distributed by Squaresoft which features the FF7 demo as well as content for other Squaresoft titles: SaGa Frontier, Bushido Blade, Einhander & Final Fantasy Tactics. Books & Other Printed Pieces. Final Fantasy VII Official Brady Strategy Guide : Like New. 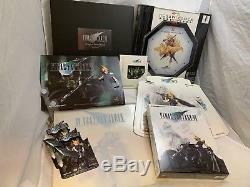 The Completely Unauthorized Final Fantasy VII Ultimate Guide by VERSUS : Like New. Syrex Unofficial Final Fantasy VII Ultimate Strategy Guide : Brand New. On The Way To A Smile: Final Fantasy VII by Nojima Kazushige : Brand New This is a collection of stories from the FF7 universe. It is all in Japanese text. 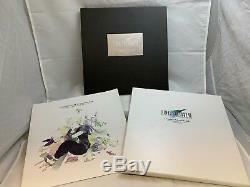 Final Fantasy VII: Advent Children Complete PostCard Book : Brand New. This is a collection of post cards with FF7 art on them. The Unforgettable Scenes From The World of Final Fantasy VII : Brand New. This is a compendium of memorable cutscenes and events from the original game. The text is all Japanese. Final Fantasy VII 10th Anniversary Ultimania : Brand New. This was an anniversary book that collected rare materials from all of the follow up games surrounding FF7. All of the text is in Japanese. Final Fantasy VII Original Soundtrack by Doremi : Brand New. 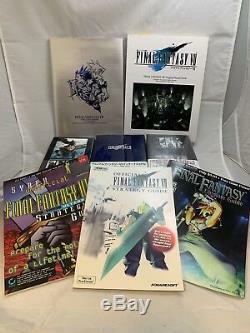 This is a rare collection of all of the sheet music from the original FF7 OST. Ever wanted to play One Winged Angel on the piano? Final Fantasy VII Static Window Cling : Brand New, Never Used. This is a promotional window cling featuring classic FFVII art. The image is reversed due to how the static cling was printed. Final Fantasy VII Hanging Shelf Tags (x2) : Brand New. These are little hanging ads for FF7 on the PC. Final Fantasy VII Desk Card Hardy Daytona Ver. This is a pop up desk card for the original FF7 on PS1. 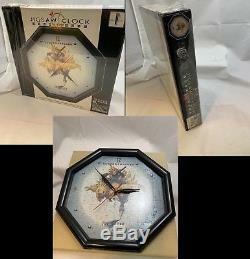 Final Fantasy VII Puzzle Clock : A rare piece of original merchandise using original FF7 art to form a puzzle with a clock in it. 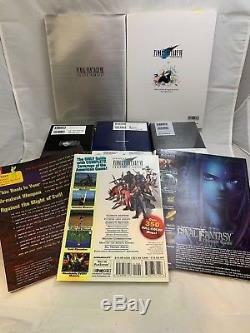 Final Fantasy VII PC Version (Box Only) : Brand New. This is an empty version of the triangle box of the FF7 PC Version. Final Fantasy VII Promo Calendar/Postcard : This is a Like New calendar with original FF7 art used through the various months. The calendar cards can also be used as postcards! Final Fantasy 20042005 Art Calendar : Brand New. This is a 13 month calendar with various Final Fantasy art on it, including FF7. Final Fantasy VII Post Card Book : Brand New. 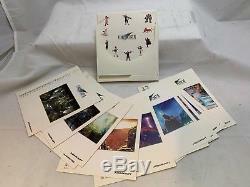 This is a collection of bound post card featuring the original FF7 art on it. 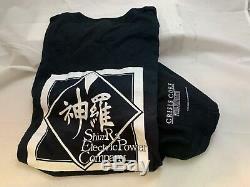 Final Fantasy VII: Crisis Core T-Shirt Shinra Power Company : (Size US Mens L) This was a promotional item for FF7:CC with the Shinra logo on it. It has never been worn and kept in a smoke-free area. 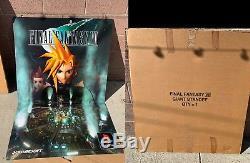 Final Fantasy VII PS1 Standee : Over 3 feet Tall. This is an unused FF7 PS1 standee featured the classic art scene and has never been assembled. (NOT PICTURED) Final Fantasy VII Branded Pepsi Box for 12-Pack. This is a weird piece of memorabilia, where old pepsi boxes were branded with FF7 characters to promote the game. Final Fantasy VII: Advent Children OST (2 Discs) : Brand New. Before Crisis / Last Order OST : Brand New. This is the official OST of the game Before Crisis and the anime Last Order. This was only released in Japan. That's 27 Ultra Rare Final Fantasy VII pieces! Thanks for looking and good luck! If you do win the lot and are in another country, we will need to work out a solution for that standee. The condition of the item listed is how it leaves my hands. So if a disc becomes loose, an accessory becomes loose, etc. The item "FINAL FANTASY VII ULTIMATE FAN LOT! NEW & MIB" is in sale since Friday, April 12, 2019. This item is in the category "Video Games & Consoles\Video Games". The seller is "shinzatsu" and is located in Redondo Beach, California. This item can be shipped to United States, Canada, United Kingdom, Denmark, Romania, Slovakia, Bulgaria, Czech republic, Finland, Hungary, Latvia, Lithuania, Malta, Estonia, Australia, Greece, Portugal, Cyprus, Slovenia, Japan, China, Sweden, South Korea, Indonesia, Taiwan, South africa, Thailand, Belgium, France, Hong Kong, Ireland, Netherlands, Poland, Spain, Italy, Germany, Austria, Bahamas, Israel, Mexico, New Zealand, Singapore, Switzerland, Norway, Saudi arabia, Ukraine, United arab emirates, Qatar, Kuwait, Bahrain, Croatia, Malaysia, Brazil, Chile, Colombia, Costa rica, Panama, Trinidad and tobago, Guatemala, Honduras, Jamaica, Barbados, Bangladesh, Bermuda, Brunei darussalam, Bolivia, Ecuador, Egypt, French guiana, Guernsey, Gibraltar, Guadeloupe, Iceland, Jersey, Jordan, Cambodia, Cayman islands, Liechtenstein, Sri lanka, Luxembourg, Monaco, Macao, Martinique, Maldives, Nicaragua, Oman, Peru, Pakistan, Paraguay, Reunion, Viet nam, Uruguay.